Combining a revised sensor design, unique spectral sensitivity, and tested functionality, the Credo 50WS Wide Spectrum Digital Back from Mamiya Leaf houses a 44 x 33mm CMOS sensor for exceptionally detailed, low-noise images with heightened sensitivity between the UV and near-infrared spectra. Its CMOS design enables notable low-light sensitivity, from ISO 100-6400, as well as a quickened 1.2 fps continuous shooting rate. Additionally, this sensor design also avails an expansive 14-stop dynamic range with 14-bit color depth for well-detailed imagery with a broad range of colors and tones. Its 3.2" touchscreen LCD provides accurate verification of color, shadow detail, and focus, and the bright 1.15m-dot screen with 170° viewing angle allows for improved viewing in challenging light. Its intuitive graphical user interface means more efficient browsing and smart navigation and the touch screen controls extend beyond the LCD to keep the viewing area clean of fingerprints and smudges. Offered here with a Mamiya 645 interface, this digital back is a versatile and high-resolution digital back for working with medium format camera bodies, as well as with view cameras or other systems using optional adapter plates. A dual-core microprocessor and the latest CF technology provides fast capture and viewing rates and USB 3.0 and FireWire 800 technology offers rapid transfer speeds. An internal battery charger keeps you ready to work un-tethered and the brilliant LCD with live view allows for clear focus and composition on the go. The Credo back also collaborates with Capture One workflow software to seamlessly edit, enhance, and present images, and with Capture Pilot, you can immediately preview images with an iPhone or iPad and remotely control your camera. Weather-sealed construction offers peace of mind when shooting in less than optimal conditions. Differing from the standard Credo 50 back, this Wide Spectrum edition replaces the UV+IR cut filter with clear optical glass in order to increase spectral sensitivity from approximately 380 to 1100 nm. This increased sensitivity near the UV and infrared regions affords the ability to record traditional infrared imagery using an IR-pass filter, standard color imagery using an IR-block filter, or infracolor imagery using orange or red filters. Featuring a 50MP 44 x 33mm CMOS sensor, this Credo back avails high sensitivity to ISO 6400, along with 14-stop dynamic range and 14-bit color depth, with minimum noise levels. The CMOS sensor structure pairs with a dual-core microprocessor to also enable a quick continuous shooting rate of 1.2 fps, a top shutter speed of 1/10,000 sec., and long exposure capabilities up to 60 minutes. 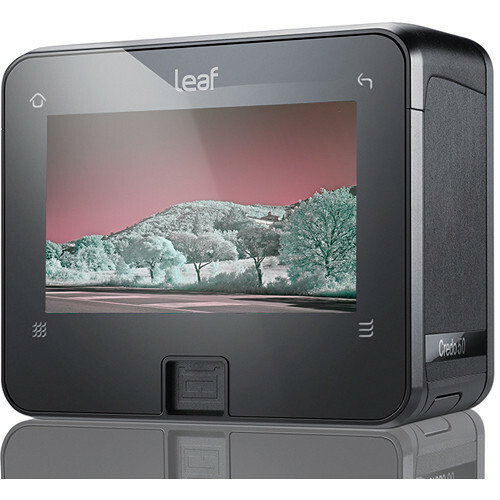 For image review and menu navigation, a large 3.2" 1.15m-dot touchscreen LCD is available, which is also aided by the CMOS sensor design for live view monitoring with fast refresh rates and low noise for intuitive viewing in a variety of lighting conditions. The touchscreen's color gamut is able to reproduce up to 16 million colors, for accurate image confirmation on location, and its viewing angle is 170° for clear viewing from different positions. Additionally, the touchscreen design extends beyond the LCD itself, which permits image adjustments without blocking your view or smudging your screen. The LCD also affords a range of features designed to benefit both location and studio photographers, including an on-screen stop watch for long exposures, a bi-directional spirit level, star ratings during image review to help save time during post-production, and precise image magnification for critical focus checking when working tethered or un-tethered. Well-suited to both location and studio photographers, the Credo 50WS avails a variety of interface and file saving options for working in both tethered and un-tethered configurations. Both FireWire 800 and USB 3.0 connections are available for tethered applications, and one card slot is available to accept UDMA interface CompactFlash memory cards. The Credo backs are compatible with a wide array of medium and large format cameras and adapters and, specifically, this back is fitted with a Mamiya 645 interface mount. Benefitting its use in trying conditions, the back is weather-sealed to resist dust and moisture. The back accepts the included 3400mAh lithium-ion battery and has an internal battery charger, allowing you to transition seamlessly between tethered and un-tethered shooting configurations. Language support: English, Chinese, French, German, Italian, Japanese, Spanish, and Russian. Exposure Time 1/10,000 sec. to 60 min. so is this purely in the wider spectrum or would you also be able to take standard color photos? To get close to regular color out of that model you would need to put an IR cutoff filter over the lens.That filter will cut about 2 stops of light. Mamiya will if you say get that back and in a few years prefer not to have the wide version, they can for a fee take the clear glass off the sensor and put on the IR cutoff filter direct.